Summary: First, let me say that the picture to the left was sent to me by Greg Weir, and the summary was sent to me by Tom Ippolito (who has his own Tom Swift site at http://pw2.netcom.com/~raven43/pers2.htm). Thanks a lot! 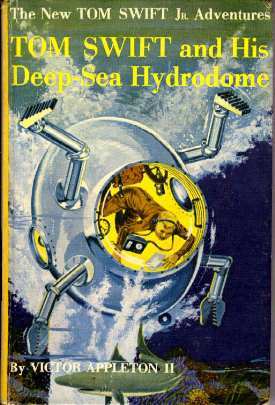 From the moment Tom swift finds himself tossed about helplessly in an undersea geyser to the time he faces possible death at the hands of his enemies, the young scientist fights to overcome many obstacles in putting his two latest inventions to use. When Tom discovers that helium on the ocean bottom had caused a geyser, he plunges into the task of building an underwater city of derricks and pipelines to capture the gas. His astounding new water-repelling machine and phenomenal hydrodome make the gigantic operation possible. While at work at the undersea mountain site, Tom and his pal Bud Barclay uncover what seems to be a pirate treasure, but find in the leaden chests a cache of death-dealing destruction. Time and again the young scientist's plans are nearly wrecked. A sinister, hooded figure attacks him in his laboratory, and a mysterious submarine nearly costs him his life. How Tom outwits his ruthless enemies and saves his country from grave danger makes a nerve-tingling story, packed with swift, tense action and high voltage suspense. There are a number of inventions and structures in this book, but they are all based on one invention: the repelatron, so I'll deal with it first. The repelatron was created to solve a complex problem -- how does one mine a helium well located 13,000 feet below the surface of the ocean? Tom thought about it for a while, fiddled in his lab, and came up with a fantastic device that can repel anything. Equipped with such a device, he tuned it to repel seawater, sank it beneath the sea, and founded his first great undersea city. Later, Tom Swift used his device to power spaceships, pour roads in the sky, and create a flying car, among other things. Ö"All right. You wanted to know how I propose getting the helium in large quantities. I believe the only feasible way is to sink a huge air bubble over our drilling setup. We could maintain a breathable atmosphere inside the bubble and work there." "A huge air bubble?" Dr. Clisby frowned. "I'm afraid I don't understand. How could such a bubble be formed?" "That's where my new invention comes in," said Tom. "It's a selective matter repeller. I've named it the repelatron. If it works out successfully, we could use it to repel the water all around us, thus creating a livable air space." "How does your repelatron operate?" Bob Anchor inquired, greatly intrigued. Tom grinned. "Well, here's the principle. As you know, matter is made up of molecules, which in turn are composed of atoms. And each atom has a central nucleus with one or more electrons orbiting around it, like tiny planets going around a sun." As the young inventor paused, Bud Barclay said, "I get the idea so far. But keep it simple." "Well, the inner arrangement of these atoms is different in each kind of matter. For instance, iron has one kind, carbon another. And because their atoms are different, they each give off a distinct type of radiation, which can be seen under a spectroscope." "Quite so," agreed Dr. Clisby. "And by studying the color spectrum of its radiation, we can identify what kind of matter we're looking at." "Sort of a chemical fingerprint in Technicolor." Bud chuckled. "Is that right?" "The molecules in sea water," Tom went on, "are made up of various kinds of atoms, each of which gives off its own special radiation, as I just explained. If I can pick up and analyze the radiation at the helium wells, and then generate a counter-radiation wave, I can repel the sea water." "That's right," said Bob. "This counter-radiation will be exactly out of phase with the incoming radiation -- and thus exert a repelling force on the sea water." "Well, that gadget [his resistorizer] was a radiation neutralizer because it changed the knockout waves that were fired at us into heat. What my new repelatron will do is simply to hurl back any source of incoming radiation waves. In other words, the two opposing rays will repel each other, just like to similar poles of a magnet." "How are you coming, skipper?" he inquired. Tom laid down his soldering fun and wiped the perspiration from his forehead. "Almost done -- with the improved pilot model, anyhow. Keep your fingers crossed." Bud stared at the compact but tangled mass of electronic parts and shook his head. "Looks like spaghetti to me." Tom burst out laughing. "Actually it's quite simple. There are only six main parts to the gadget." "Go ahead and name 'em -- just to confuse me," Bud retorted. Well, first, this is the detector, to pick up the radiation from whatever we want to repel -- in this case, water. Then there's an analyzer to break down the radiation into its separate components; an amplifier to boost the strength of the signal; and a phase inverter to put the radiation exactly out of phase." Tom paused and grinned at Bud, whose eyes were already assuming a glazed look. "Next is the power amplifier to produce the output wave. And last is the radiation which sends out the radiation to repel the water." City construction. A repelatron, as Tom demonstrated in this very book, could easily be used to create an undersea city of whatever size you desired. Using slightly different principles, it could also be used to create cities in the sky. Road construction. A repelatron, as Tom showed in Tom Swift and his Repelatron Skyway, could easily be used to create roads in the sky -- or bridges over the ocean. In fact, with a repelatron, there's little difference between going over water or over land, so distinctions like "bridge" and "road" would be archaic. Spaceship propulsion. A repelatron is a scientist's dream -- it can take electricity and turn it directly into thrust. Equipped with an atomic-powered repelatron, you could easily and cheaply tour the galaxy -- as Tom Swift did in his Cosmotron Express. Mineral identification. A repelatron -- as Tom Swift demonstrated in Tom Swift and his Aquatomic Tracker, is extremely useful in the identification of compounds. Tom Swift showed how useful this feature is by creating a submarine that can track other submarines by the chemical residue they leave behind in the water! Weather and famine prevention. A repelatron tuned to repel water would be very effective at stopping rainstorms. No longer would rivers have to flood and football games have to be rained out -- just turn on your repelatron and divert the water elsewhere. This might also be useful in getting water to deserts or dry areas -- a repelatronic system should be able to get water wherever you needed it. Can anyone else think of any more uses for this fascinating invention? I'm thinking about creating a page devoted solely to this unique invention, so if you can think of any more uses and e-mail 'em to me I'd appreciate it. There are two other things that Tom Swift created in this book that depend on the repelatron. One of these inventions is his Undersea City, which he built to mine the helium wells he discovered underneath the sea. 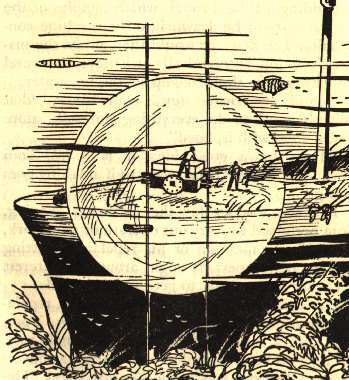 (It should be noted that this isn't the only undersea city he built -- Tom Swift created another one over a city of gold in Tom Swift and his Spectromarine Selector.) The concept of constructing a vast city underwater is not unique, but Tom's method of creating such a city certainly is. The city (there's a picture of it a page up or so) is basically simple. A large repelatron (or several, I'm not really sure) is hauled underneath the city. The repelatron is activated and creates a huge "hole" in the water. The hole is constantly filled with air extracted from the ocean. To keep fish from falling into the city -- and to keep the humidity to a bearable level -- four large steel girders were erected over the city and a transparent plastic dome was put over the girders. There were two methods of entering the city: you could ride an elevator down to the bottom of the ocean or you could go down in a submarine. Once down, you simply got out of your submarine or elevator, walked over to the dome, opened the door, and walked in. The other invention in this book is an undersea elevator. I've scanned in a picture of it and placed it to the left, so you could see what it looks like in action. Basically, it's a steel platform tethered by two long cables that has a repelatron mounted on it. By adjusting the size and buoyancy of the air bubble created by the repelatron, the ship can maneuver vertically. The device was used by Tom to ferry his men to his Helium City; however, he also used it for other purposes. In the above picture, Tom Swift is using this elevator to salvage a ship. 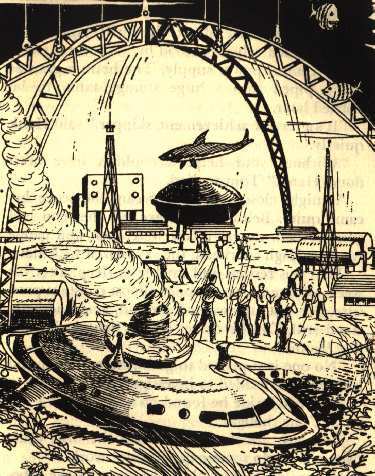 As you can see, it's a unique experience -- the deck upon which the repelatron sits has been made perfectly dry, and Tom Swift can just walk (not swim) to the ship's safe. Wouldn't it be neat to have a device like that to salvage ships, or to explore the ocean bottom? One could really get some exploring done then!